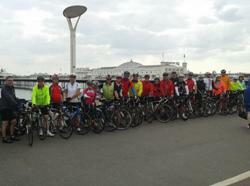 Join this Classic British bike ride! 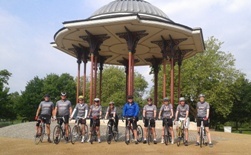 From our capital, we shall ride down and across the North Downs, and through beautiful Sussex countryside, via some quintessentially British country towns and villages. The big challenge of the ride is the infamous Ditchling Beacon, recognised in the '100 Greatest Cycling Climbs' - which although not particularly high, makes up for its lowly altitude in its legendary steepness. Will you make it without getting off? Finally it's a rapid descent into Brighton, down to the sea. Anyone for a dip? This ride is probably the most famous ride in the British Isles, with thousands undertaking it each year. The ride is a very manageable distance, but don't be fooled, there are a few hills along the way! We shall set off early from Clapham Common, and we expect to reach Turner's Hill for lunch time. Our afternoon ride is slightly shorter, but remember, we shall be tackling the South Downs. We expect to arrive into Brighton for mid to late afternoon, in plenty of time to get back to London again. You may wish to stay around in Brighton for the evening, or you may hop straight on the train to head back. Adventure Cafe can offer an optional bike return service, please ask for details. Experienced & first-aid trained cycling leader. Support vehicle with first aider, mechanical back-up, spare parts, and refreshments. By nature all activities contain an element of risk.Your leader will be first aid qualified and will carry the appropriate safety kit for the activity. Safety equipment carried will be appropriate to trip. The leader's primary role is to ensure your safety, but it is your responsibility to listen to their guidance and instructions. You should arrive as a proficient and competent rider. This ride is NOT suitable for inexperienced riders. Please note you should ensure you ride well spaced out and in single file at all times - this is an important safety instruction. Being in the UK we should be prepared for anything. Whilst not wishing everyone to bring heaps of equipment we should be prepared for wet and hot. Bring both products/equipment to protect from hot sun, and also to protect in case it rains. It is unlikely to be too cold at this time of the year.